The TETRA radio system ACCESSNET®-T IP from Hytera provides all the advantages and the full feature set of the open ETSI-standard TETRA. The highly scalable and modular system covers all requirements of demanding and especially security-concerned users and provides the radio coverage and services you need - from smaller networks to nation-widepublic safety projects. 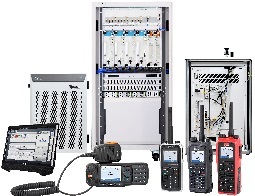 Hytera developed ACCESSNET-T IP in compliance with the specifications of the European Telecommunication Standards Institute (ETSI) and it meets all of the requirements of the internationally recognized TETRA standards (Terrestrial Trunked Radio). Secure voice and data transmission as well as numerous features ensure adaptability of our TETRA radio system to the demands of PMR users. ACCESSNET-T IP stands out by its high system availability and robustness against external influences. It is exactly the right choice to ensure reliable communication to stay connected anytime - especially in mission-critical situations. To protect your communications against any unforeseen events and external influences, numerous redundancy options are available to e.g. cover important hardware components. With the geographical redundancy options it is also possible to distribute the intelligence within the system and further raise the robustness. Even a partial breakdown of the backbone will not affect the single radio cells thanks to the powerful isolated operation modes. Investing in ACCESSNET-T IP will reduce your total cost of ownership (TCO), in terms of capital expenditures (CAPEX) as well as operational expenditures (OPEX). One key aspect beside the reliability of communication is the security of communication, especially in public safety sectors. Hytera´s radio system supports all the security features defined by the TETRA standard like air interface encryption (AIE), end-to-end encryption (E2EE) and authentication.